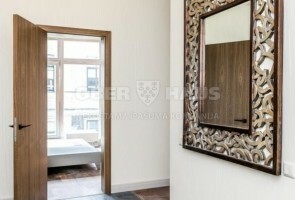 For sale ​​2-bedroom/ 2-bathroom apartment (76,2 sq.m.) with well-thought-out layout in a fully renovated courtyard building, second floor. 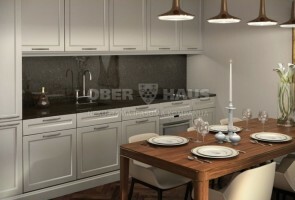 The apartment offers high-quality interior finishes. Lots of natural daylight fills the apartment. Views of inner courtyard. Fire-rated entry doors. Ceiling height 3.1.m. Water and heating provided by local municipality. Individual utility meters in every apartment. The building was designed by the Latvian architect Edmunds von Trompovskis in the early 1900s, and has undergone a full renovation in year 2016. 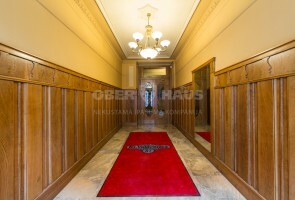 There is a new and modern elevator and a beautifully restored and preserved staircase in the building. The renovated buildings are part of the historical heritage of Riga. A big advantage is the location of the building, located near the quiet center of Riga and 10 minutes walk to Old Riga, city parks and squares. Despite the central location, this section of Dzirnavu Street is quiet and safe. There are 9 apartments in the main facade building. There are also 9 apartments located in the courtyard building. There are 4 parking spaces available in the courtyard. Price for each parking space: 20,000 EUR. 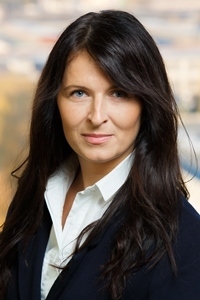 Property Management Fee: 0.80 EUR/ kv.m.